There’s a quiet but dramatic change going on within christianity, about our understanding of the death of Jesus. Critical non-believers often seem to be unaware of it. Many christians seem to be unaware of it too. But it is making a major difference to how christians see God, the scriptures and their faith. And Easter is a good time to think about it. One of the strongest criticism of christianity by non-believers is that God is portrayed in the Old Testament, and even sometimes in the New Testament, as angry, vengeful and punishing. They point to passages in the Old Testament where God is reported as commanding wholesale killing, virtually ethnic cleansing of Canaan to make room for the Israelites to live in their promised land. And if christians point to the loving God revealed by Jesus, sceptics can argue that the christian belief in the atonement, the idea that Jesus died for our sins, is virtually child abuse – an angry God killing his son to further his own purposes. While this is an exaggeration and a misrepresentation of christian theology, it has force. Many christians don’t realise that over the two millennia of christianity, a number of different understandings of the atonement have been favoured by christians. This blog isn’t the place for a full discussion of atonement theology, but we can distinguish three different ideas. There are various theological theories, but Penal Substitutionary Atonement (PSA) is the most believed by Protestants these days. In summary, it says that sin breaks God’s law, so God’s justice demands punishment for sin, and that punishment is death. Jesus, the perfect sacrifice, accepted the punishment as a substitute for the human race, so we don’t need to face the punishment of hell. This understanding of the atonement is supported by a number of Bible passages, notably the whole Old Testament sacrificial system. But critics argue the passages should be understood differently. Christus Victor: All people are under the oppression of evil, as personified in Satan, but Jesus defeated evil, which allowed us to be free. Sometimes this idea is expressed as Jesus paying the ransom to redeem us, or Jesus “swallowing up” evil, so we can be free. The defeat of the devil was the view of the earliest christians and is well supported in scripture. Many passages which are used to support PSA can be understood in Christus Victor terms. Recapitulation: Jesus entered into all of human life, but lived the moral life that we have all been unable to do. He is thus able to overcome death rather than be destroyed by it, and to perfectly unite us with God. This ancient understanding is the predominant Eastern Orthodox view. Both these views emphasise a loving God rescuing and healing a broken humanity, rather than an angry God punishing anyone who doesn’ believe in Jesus. This view emphasises that Jesus is our brother, the first to conquer death, and an example for us all. His selfless sacrifice motivates and changes us to follow him in selfless living. The Christus Victor, Ransom and recapitulation views were the main emphases in the early church, and remain the main teachings of the Catholic and Eastern Orthodox churches. The PSA really only came into prominence during the Reformation, and is currently the view of Reformed and conservative Protestant churches. It seems to suggest that God is angry but Jesus is loving, which is contrary to christian and Biblical teachings that God is most fully revealed in Jesus. It is built on a courtroom analogy of retributive punishment, whereas the Bible seems to reveal a loving God who wants to bring healing and restorative justice. It suggests that God needs to change (i.e. stop his wrath) before he can forgive us, which seems to demean God. Jesus calls us to forgive others unconditionally, yet on this theory God isn’t able to do this. In fact, God doesn’t really forgive at all, he just punishes someone else (Jesus) instead of us. Some christians who emphasise (as Jesus did) non-violence believe that penal substitution justifies violence, anger and even “divine child abuse”, and so can’t be right. The cross deals with broken humanity rather than an offended God. Penal substitution is sometimes expressed in unattractive and even lurid ways that emphasise God’s anger, human depravity, punishment and eternal conscious torment in hell, and some of its adherents seem to enjoy the prospect of non-believers suffering, views that other christians find repugnant. The idea of everlasting, conscious torment in hell for a finite amount of sin (which generally is part of PSA thinking) seems to many christians to be unjust, impossible for a loving God, and not supported by scripture. So there is a small but growing movement within Protestant christianity to move away from PSA and hold to other views that, it is believed, are more Biblical and more honouring to God, by emphasising his love rather than his anger. The view is more common in Anabaptist and “progressive” Protestant churches, thinkers and writers (such as Greg Boyd, Benjamin Corey and Tony Jones) but is gaining ground across Protestantism. Old Testament God vs New Testament God? These developments in atonement theology seem to have come in parallel with a renewed concern over the apparent difference between the sometimes violent God of the Old Testament with the non-violent loving God of Jesus. Simply ignore it and focus on Jesus – we can put aside anything (even the Old Testament) that portrays God as less loving than we see in Jesus. God revealed himself progressively, bit by bit, as people were able to receive and understand. The violent God of the Old Testament was based on a very partial and early understanding, later corrected and updated by the prophets and Jesus. The Bible records how people understood God at various times in human history, and we now know better than the Old Testament writers, because we have a newer revelation in Jesus. Thus we can see two quite distinct views – one which sees God in both Testaments as being angry and punishing towards sin and sinners, and the other based on the God of Jesus (who is a fuller revelation than the God of the Old Testament) who is loving, healing and forgiving. Some readers may be wondering at this point – is all this for real? It is all very strange, and seems quite illogical to modern thought. But belief in a God, in the supernatural, and in God intervening in human affairs by way of communication or healing, are all problematic for many people today. But if there is a God and Jesus is his incarnation on earth, as christians believe (for reasons which we won’t go into now, but christians think there are good solid reasons to believe these things), then spiritual matters are bound to seem strange to modern and postmodern thinking. But that in itself says nothing about whether it is true. Whether we agree with these developments or not, I think it is clear that change is coming. New generations of christians are less willing to accept a view of God they find unloving, and more willing to consider new approaches to theology and doctrine. The theology of the atonement is not clearly spelt out in the Bible, so christians are free to change how they interpret things. Protestant christianity is changing in many ways. A return to an older, and more loving, interpretation of the atonement, new understandings of the Old Testament, renewed interest in Jesus as a first century Jewish prophet and Messiah who inaugurated God’s kingdom on earth, and a renewed commitment to building that kingdom via active expressions of justice and mercy (rather than sitting pat until we can cash in our ticket to heaven) are all part of that new understanding. I’m right on board with all of that! So this Easter, I focus on Jesus, the beloved son of God spearheading a new phase in God’s relationship with the much-loved people he created. That focus encourages me to “act justly, love mercy, and walk humbly with God”. Many non-believers in formerly majority christian countries were once christian, but rejected a view of God that seemed neither well-evidenced historically nor attractive. These newer approaches to following Jesus sidestep some of the major difficulties such “deconverts” faced. In time, I would guess (and hope) that some would find themselves reconsidering. They may have rejected a God that many christians have also rejected, and they may therefore by willing to check out the God such christians do believe in. And those who remain non-believers, especially those who are outspokenly critic of christian belief, will find they will need to update their apologetic. Some of their well-preparted arguments no longer apply (though they may have contributed to this renewed understanding among christians by highlighting problems with the more conservative belief). Saving the World, Revealing the Glory: Atonement Then and Now. NT Wright. Some Problems I Have With Penal Substitution Theology of Atonement. Benjamin Corey. Seeing the Cross with New Eyes by fellow blogger Wesley Rostoll. 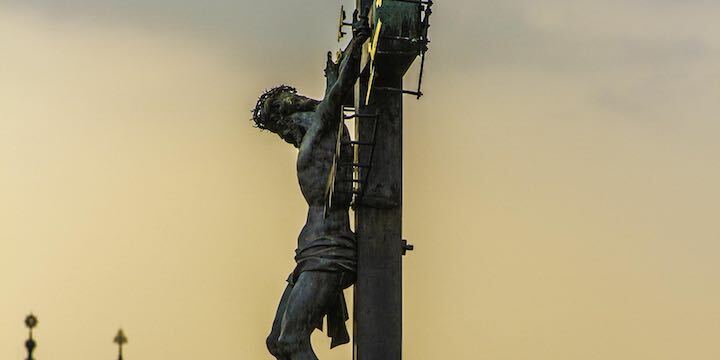 An Eastern Orthodox view of the atonement, and of penal substitution. Contrasting Catholic and Reformed views.